This was taken at the 1993 Tour, on the Col de Restefond, one of the highest in Europe at 2680m on only the second occasion the Tour has climbed it. Robert Millar crossed the summit alone enroute to the finish at Isola 2000, but unfortunately, he was caught on the final climb. 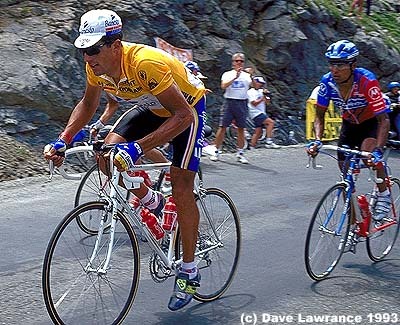 This picture shows Miguel Indurain applying the pressure with Columbia's Alvaro Mejia just behind.